AFC Bournemouth defender Rhoys Wiggins has been forced to retire following a serious knee injury suffered almost two years ago. The 30-year-old, who was on loan at Birmingham City at the time, was stretchered off during the Blues’ 1-1 draw against Aston Villa in October 2016 and hasn’t featured since. Following a number of operations, Wiggins has called time on a professional career that saw him appear for Crystal Palace, Norwich City, Charlton Athletic, Sheffield Wednesday and Birmingham, as well as three spells at AFC Bournemouth. The former Wales under-21 international made 72 appearances in all competition for the Cherries, having first arrived on the south coast in January 2009, on loan from Norwich. 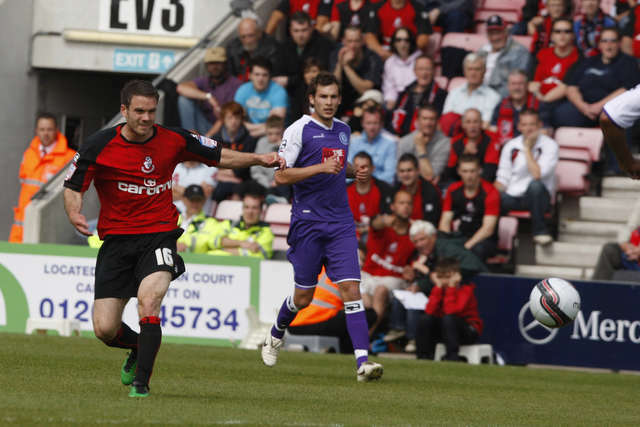 A year later, Wiggins returned to the Cherries for the second half of the 2009/10 campaign, playing his part in the club’s promotion from League Two and subsequently signing permanently that summer. After departing for Charlton in 2011, he returned almost five years later for a third spell, with the Cherries in the Premier League. "I’m really sad for Rhoys," said AFC Bournemouth manager Eddie Howe. "Whenever a career ends prematurely it is always a sad moment. "Rhoys has played a really important role in our recent history. When we were fighting to stay in the Football League, he signed on loan for us from Crystal Palace and was excellent. "I always rated him really highly as a player, both for us and when he lined up against us. "The really sad thing is that he ended up getting a couple of really serious injuries that unfortunately meant he never got to play in his latest spell for us and never got to play in the Premier League. AFC Bournemouth chief executive Neill Blake added: "Rhoys has been a great servant to the club over three spells and I would like to thank him for his commitment and contribution during that time. "He has been a very good player and his character and personality have always been very positive, even in some difficult times. "It will never be forgotten that Rhoys played an important part in our journey to the Premier League, and he will always be welcome back here with open arms."